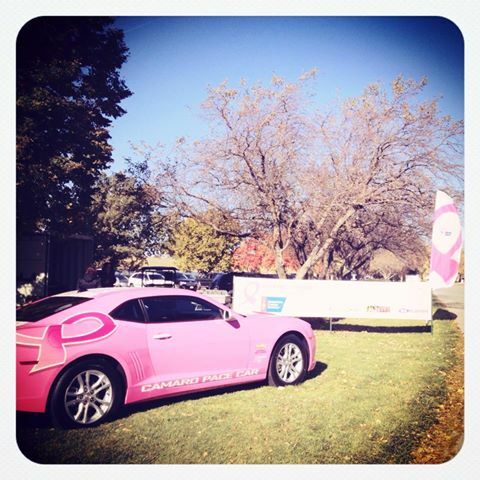 Chevy’s Pink Camaro and Lincoln, NE Making Strides Against Breast Cancer event on October 27, 2013. The Making Strides Against Breast Cancer Pink Camaro was the number two highlight at this year’s Just For Her Event on October 11 – 13. Gregg Young Chevrolet provided visitors the opportunity to check out the unique car and sign up for special news and offers from Chevrolet. For each person that signed up Gregg Young contributed one dollar to the American Cancer Society’s Making Strides Against Breast Cancer event. 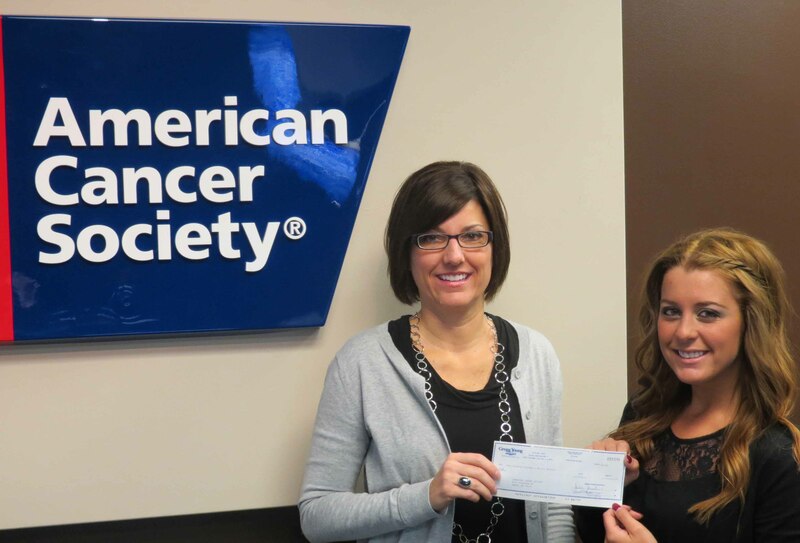 Dia Snyders, Gregg Young’s event coordinator, visited the American Cancer Society offices and presented a $415 check to Deb Seaton, Senior Representative, Community Engagement in Omaha. This donation is in addition to the Heartland Chevy Dealers being Flagship Sponsors of the Making Strides Against Breast Cancer Event that took place on Sunday October 27th at Holmes Lake Park in Lincoln. . Preliminary numbers from this year’s event indicate that there were over 6000 walkers and monies raised is near of over $275,000. If you would like to learn more about Making Strides Against Breast Cancer, Gregg Young Chevrolet or the Just for Her Event visit the websites listed. “Kindness… Pass it on!” is written on the wall at Gomez-Heritage Elementary School in Omaha. It was passed on this afternoon. Rewind a couple of months ago when a group of students known as the ‘Leader Stars’ decided they wanted to do a project to help the community. They decided to do a fundraiser for the American Cancer Society’s Relay For Life of Midtown Omaha. In a matter of two weeks, the students raised over $2000 by collecting dimes and any loose change they found. (FYI: Did you know that if you fill a regular bottle with just dimes, it will equal $100? Well… I didn’t, but those smart students did!). As the donations came in, and the students were told where the donations were going, Kindergartener Perla Aispuro (in the light blue cape) decided she wanted to do more. She wanted to donate her hair to other kids who weren’t as fortunate as her. She wanted to donate her hair to kids who had lost their hair due to a medical condition. Let me repeat that … a KINDERGARTNER wanted to do more. Inspired by Perla, 10 other students, teachers and parents decided they wanted to do ‘more’ and to pass the kindness on. They would also donate their hair to Locks of Love. Ramona, a friend of one of the student’s parents, was one of the inspired. She had been growing out her hair for four years and had 28+ inches cut off! Marcela, another parent, decided to donate her hair to set a good example for her daughter. (Her daughter will be cutting HER hair next week, after her First Communion). Valeria, a Pre-K Teacher, decided the morning of the donation that if her students could do it – she could too! Over 160+ inches of hair were donated by the group! When I asked the Leader Stars what their role is at the school, they told me they have to get good grades (I expect that isn’t an issue with them), be nominated by a teacher, and to be good citizens in school and in the community. Based on the leadership I saw from them, and the inspiration from little Perla, I would say they are succeeding. They ARE passing the kindness on. Thank you students, parents and teachers of Gomez – Heritage Elementary. Thank you for supporting the American Cancer Society … and thank you for inspiring us all with your kindness. Special thanks to: Gomez – Heritage Elementary Administration and Staff, Pigtails and Crewcuts stylists Michelle Paris and Elizabeth Adame, Kindergartners Perla Aispuro and Samantha Melgoza, First Graders Andrea Rodiguez Garcia and Melanie Seriana Lorenzana, South High School student Fatima Garcia Vargas, and parents Marcela Torees, Ramona Mora, Veronica Vasquez, Karla Lorenzana, Alma Garcia and Valeria Rangel. The American Cancer Society would like to recognize and thank Alice Buffett Magnet Middle School Students for their donation of $660.00 toward the fight to end cancer. Students making an impact, taking action and making some noise all to help finish the fight against cancer. Thank You!